Following the deaths of hundreds of people, including children, in the Syrian city of Aleppo over the past week, the Arab League will hold an emergency meeting requested by Qatar to discuss a way forward. The meeting will be this Wednesday, May 4. It comes as charities in Qatar launch emergency aid efforts to the city, providing food, medicines and medical expertise. Speaking to his British, French and Turkish counterparts by phone yesterday, Qatar’s foreign minister discussed the humanitarian conditions in Aleppo, “in light of the continuous Syrian regime’s brutal shelling of civilian institutions and people,” QNA reported. Expressed our concerns over military escalations in #Aleppo. Violations of cessation of hostilities & bombings of civilians must stop. Days earlier, Al Thani “strongly condemned” the attacks. “We call on the international community to carry out its responsibilities to stop the war crimes committed by the regime & protect Syrians,” Al Thani added. Yesterday, the General Secretariat of the Arab League agreed to a request by Qatar’s League envoy to hold an emergency meeting of permanent delegates to talk about attacks in Aleppo. “The meeting’s agenda is discussing the dangerous escalation seen in Aleppo where civilians are subjected to massacres at the hands of the forces of the Syrian regime, which led to the deaths and injuries of hundreds,” QNA reported. Meanwhile, Qatar-based charities have launched new relief efforts in Aleppo in response to more than a week of attacks on the northern Syrian city, which have killed nearly 250 civilians, Reuters reports the Syrian Observatory for Human Rights as estimating. Qatar Charity has a QR10 million aid budget for its work in the city, it said yesterday. Its workers on the ground have started distributing food packets to families affected by the shelling. It will also treat the injured and provide medical staff and medicines to healthcare facilities. Donations can be made to the charity through its Arabic website, via phone by calling its hotline 4466 7711, by text message, bank transfer or at booths in shopping malls, the charity added. 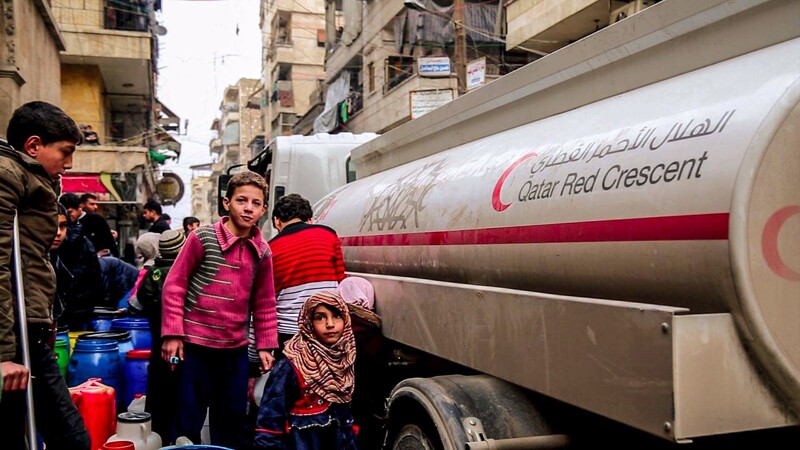 Qatar Red Crescent Society denounced the attacks on health facilities in Aleppo as it launched a $200,000 fund for medical supplies, food, and fuel as part of its humanitarian relief effort in the city. This includes 1,850 medical kits, 28,000 liters of fuel, water purification pills, and food items, costing $80,000, the charity said in a statement yesterday. Early in April, Qatar Red Crescent began operating the Al-Sakhour Medical Center, which it said is the only health facility in this part of the city of Aleppo. The center has received more than 100 visitors per day, working with a budget of $185,000 till year-end. The charity is providing medications, medical consumables, and surgical serums for hospitals in Aleppo city and countryside, it said. Donations to its work can be made online or by calling 16002. Another Qatar-based charity, the Sheikh Thani Bin Abdullah Foundation for Humanitarian Service (RAF) yesterday launched a new relief campaign “For Aleppo” in collaboration with the Holy Quran Radio aimed at collecting donations to support field hospitals to treat the wounded in Aleppo and other Syrian cities, QNA reported. Donations can be made through its website here. 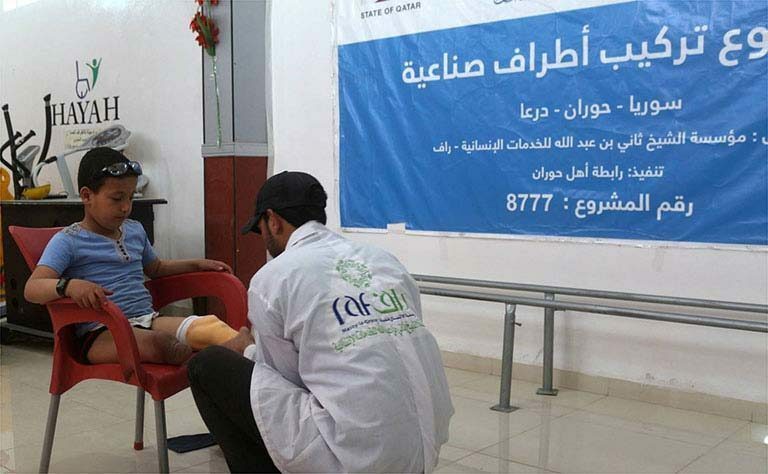 Finally, the Sheikh Eid Bin Mohammed Al Thani Charity Foundation said it has mobilized its emergency crews – which include 40 ambulances and about 150 paramedics – to travel to Aleppo to treat those injured. Some 25 cars have transported the wounded to get emergency first aid. 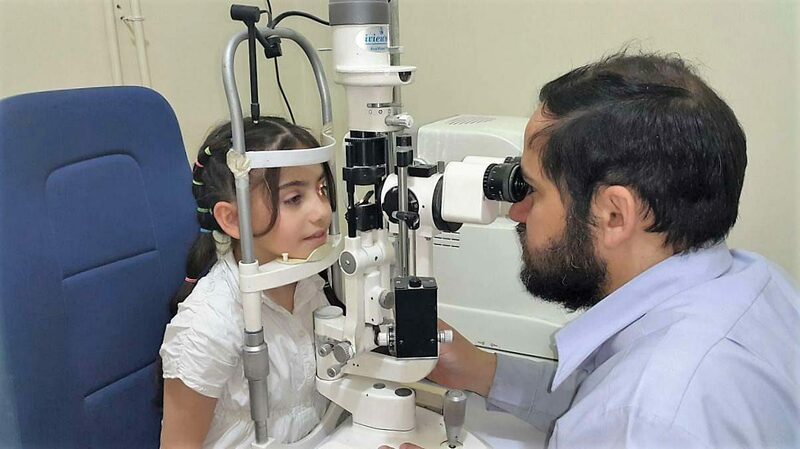 The charity said in a statement on QNA that it is setting up field hospitals outside the city of Aleppo to provide treatment and perform emergency surgery for those displaced people from Aleppo to the northern countryside. Details of how to donate to the charity are on its Arabic website here.